Most people would agree that in order to get a large, sharply defined zone of die-struck design on one face, there has to be resistance to the strike that is applied to the opposite face. 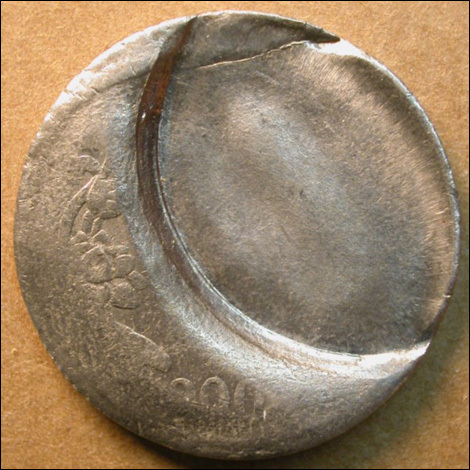 When resistance to the impact of a die is low or non-existent – perhaps as the result of an abnormally thin planchet, a defective planchet, or a broken die – the strike should be weak or absent. Generally this principle holds up. But there is one rare exception – the “extrusion strike”. This phenomenon was extensively described and analyzed three years ago in Errorscope, the bimonthly magazine of CONECA (Diamond, 2004). An extrusion strike is a rare effect that may be found in association with a wide range of error types including indents, partial brockages, large strike-throughs, and retained cuds. Except for the last, each of these errors involves a planchet that is trapped between one of the dies, the overlapping intrusive object, and the collar. At the same time, an avenue of escape is left between the edge of the intrusive object and the collar, a gap into which part of the planchet bulges or extrudes. Coin metal likes to follow the path of least resistance, bulging into the gap and colliding with the die face that seals off the gap. At the same time, the coin metal withdraws from the opposite die, leaving a featureless pucker or trough on the opposite face. Now, all this might seem a bit confusing, but all will become clear momentarily. Figures 1 and 2 show a truly stellar example of an extrusion strike in association with a large indent. 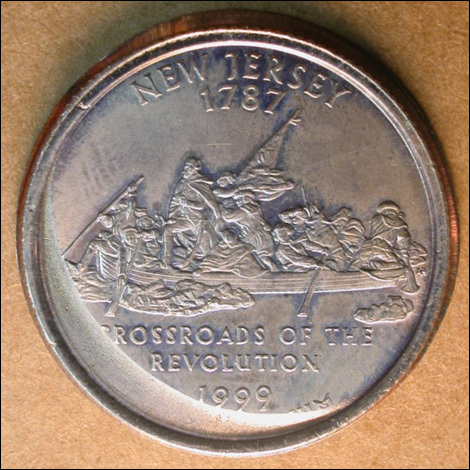 The indent on this 1999 New Jersey quarter was produced by an unstruck planchet that intruded into the striking chamber and that was interposed between the obverse (hammer) die and the planchet represented by this coin. Beyond the indent on the obverse face there is a well-struck crescent of obverse design bearing the words UNITED STATES OF. The outer parts of the letters terminate abruptly as they meet a downward sloping surface that ends at the edge of the coin. Figure 1a. Obverse face of a 1999 New Jersey quarter with an 85% indent and a clear extrusion strike on the obverse face. Coin acquired from Alan Levy. The reverse face shows a die-struck design opposite the indent. Beyond that is a featureless crescent that lies opposite the die-struck obverse design. This featureless zone is deeply recessed. The die-struck reverse design ends abruptly at the internal margin of this crescentic trough. Figure 1b. Reverse face of the same specimen showing a sharply defined, deeply recessed, crescentic trough. The edge of the quarter shows a complete and very strong partial collar error. In other words, the collar was partly deployed as the coin was struck. This is very important, as an extrusion strike cannot form if the collar is not deployed and the coin is consequently broadstruck. Figure 1c. Edge of the same coin photographed at the midpoint of the extrusion strike. A strong partial collar is easily seen. Figure 2a. Close-up of the crescentic trough. Figure 2b. Extreme close-up near the upper horn of the trough, showing a granular texture and microscopic compression lines. 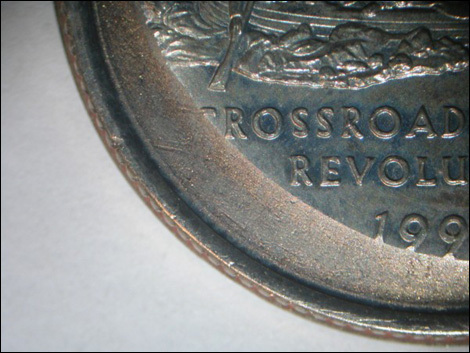 The odd appearance of this coin is explained graphically in Figure 3. The bottom planchet (the coin under discussion) was trapped between the overlying planchet, the reverse die, and the collar. The gap between the overlying planchet and the collar served as an avenue of escape for the coin metal. The coin metal bulged up into this gap, simultaneously drawing away from the reverse die. The apex of the bulge slammed violently into the obverse die face suspended just above it. The sloping lateral side of the bulge is represented by the sloping surface seen just beyond the truncated letters of UNITED STATES OF. Figure 3a. Schematic diagram of a coinage press that will shortly produce an extrusion strike. Figure 3b. Schematic diagram showing the aftermath of the strike. This is how the kind of extrusion strikes illustrated in this article form. 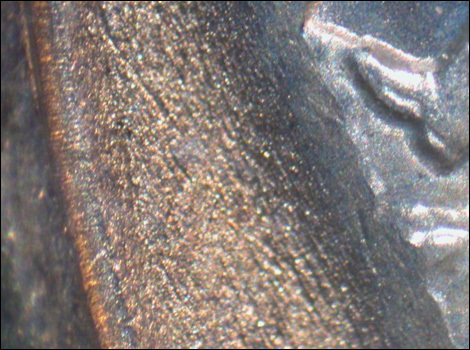 The unstruck crescent on the reverse shows evidence of the tremendous compressive and bending stresses this part of the coin was placed under. The surface is grainy because metal crystallites “pop out” when placed under such stress. Numerous microscopic compression lines are also visible, especially in the “horns” of the crescent. Extrusion strikes this dramatic are surpassingly rare. This is the second best example I’ve seen on any U.S. coin. The best one I’ve seen is a Connecticut quarter with an even larger extrusion strike in association with a partial brockage. I haven’t seen any decent examples among cents, nickels, half dollars, or dollars. I’ve seen a few examples on dimes, but they were much smaller relative to the total area of the coin. Indents, partial brockages, and large strike-throughs are common. So why are extrusion strikes so rare? Essentially, it is because many different parameters must line up just right. (1) The planchet has to be just the right thickness. Nickels, for example, are probably too thick for a decent extrusion strike to form. (2) The thickness of the intrusive object does not seem to be as important, although it may still play a role. (3) I’m not sure if planchet hardness is involved, but I’ve never seen a decent extrusion strike on a silver coin, a copper-alloy U.S. cent, or a copper-plated zinc cent, all of which are relatively soft. (4) The intrusive object has to be just the right size, shielding somewhere between 60% and 90% of the planchet’s surface. (5) The collar must be deployed, either completely or partially. (6) Finally, ram pressure and minimum die distance have to be just right. 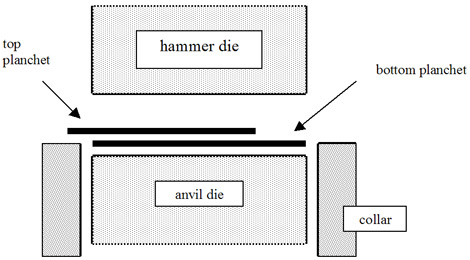 Ram pressure is the amount of force that is set to be delivered by the hammer die in the presence of a planchet, presuming minimum die distance is normal. Minimum die distance refers to the closest approach made by the dies in the absence of a planchet. Under normal striking pressures (determined by a combination of ram pressure and minimum die distance), an extrusion strike fails to form and both faces show a die-struck design beyond the indent/brockage/strike-through. An extrusion strike therefore requires either abnormally low ram pressure, excessive minimum die distance (insufficient die approximation), or both. Our second specimen is an Indian 5 rupees coin with a large indent (approximately 60%) and a weak extrusion strike on the reverse face (Figure 4). 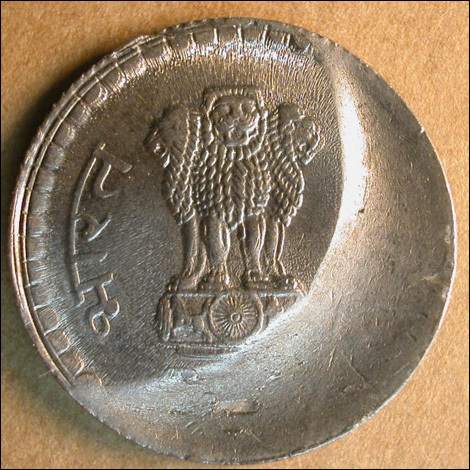 In Indian coins, the reverse face is almost always struck by the hammer die, which appears to be the case with this specimen. 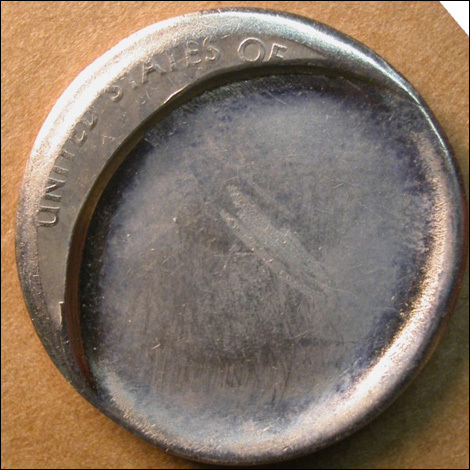 Although struck fully within the collar, there is a slight trace of a partial collar lip adjacent to the reverse face along a few arc degrees of the coin’s edge. 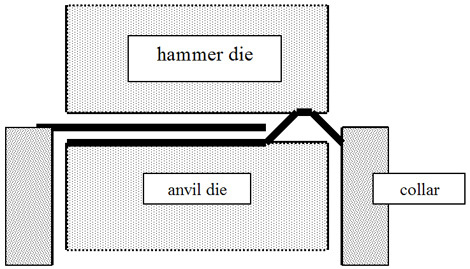 Figure 4a. Reverse face of an India 5 rupees coin, showing a 60% indent and a weak extrusion strike. Figure 4b. Obverse face of the same coin showing an oval area of die-struck design opposite the indent, and a scooped-out, crescentic zone lying opposite the extrusion strike. Ordinarily, I wouldn’t expect an extrusion strike to form on a 5 rupees coin, because these copper-nickel coins are quite thick and heavy. They weigh in at around 9 grams, although at 23mm, their diameter is only slightly greater than that of a 5 gram U.S. nickel. The extrusion strike on this coin owes its existence to the fact that we’re dealing with an abnormally thin planchet that weighs a mere 4.9grams. I assume that the indent was from a normal 5 rupees planchet, which makes this weak extrusion strike rather impressive in hindsight, as the coin metal had to rise several millimeters in order to reach the reverse die face hovering overhead. The crescentic trough on the reverse is correspondingly very deep. Only the very apex of the domed coin metal contacted the reverse die face. Consequently, a very broad, gently sloping surface falls away from the struck design to merge with the edge of the coin. Extrusion strikes provide a fascinating exception to the notion that a die-struck design can only be generated against resistance applied to the opposite face. Here, the coin metal bows upward at high velocity and smacks into the die face with significant force. The die face is the passive partner in this relationship.